This social media thing can be great. You can get up-to-the-second news on events you find important. On the flip side, it is often too easy to spread something false. In internet parlance this is called "trolling". This is sowing the seeds of discord by being inflammatory. Others might say that it's simply online schadenfreude - i.e. gaining enjoyment from the misfortune of others. Well, for those closely seeking Dodger news on twitter this afternoon, we got had. For some it cause great consternation, for others fear. So, what was spread? A handful of tweeters in St. Louis gave second-by-second updates on what Puig was doing. During the Dodgers pregame practice, Puig was shagging balls in the outfield. Then a single tweet rolled in. Soon, a full-on freak out was occurring. Dodger fans were cursing at the stars. 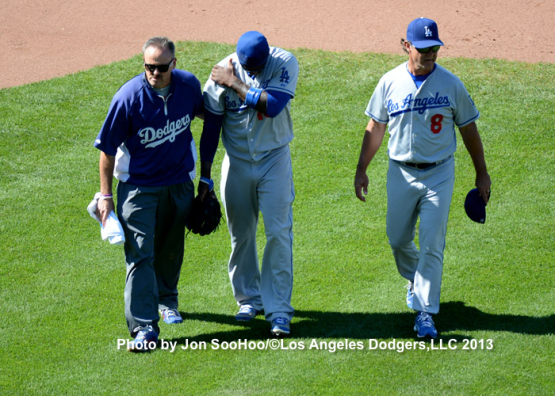 I'm sure others were ready to blow up with screams about the immaturity of Puig to reinjure his wrist during practice. The calm among us waited for confirmation. I can safely say that the latter wasn't me. Fortunately, confirmation never came. Instead, we find out that he was launching long balls during his batting practice session. Woo! Now I can wipe that sweat from by brow, and curse at the trolls who almost gave me a heart attack. Anger and frustration has now been diverted. #Dodgers today recalled shortstop @FlashGJr and optioned right-handed pitcher Stephen Fife to @AbqTopes. I do not know if he is in St. Louis right now. Nick Punto is scheduled to start tonights game against the Cardinals. The Los Angeles Dodgers today recalled shortstop Dee Gordon from Triple-A Albuquerque and optioned right-handed pitcher Stephen Fife to Albuquerque. Gordon, 25, has hit safely in his last 17 games with Albuquerque, batting .366 (26-for-71) since July 14, and overall is batting .307 with a Pacific Coast League-leading 44 steals to go along with 16 doubles, eight triples and a .398 on-base percentage in 80 games. With the Isotopes, Gordon has hit .299 (23-for-77) with runners in scoring position. 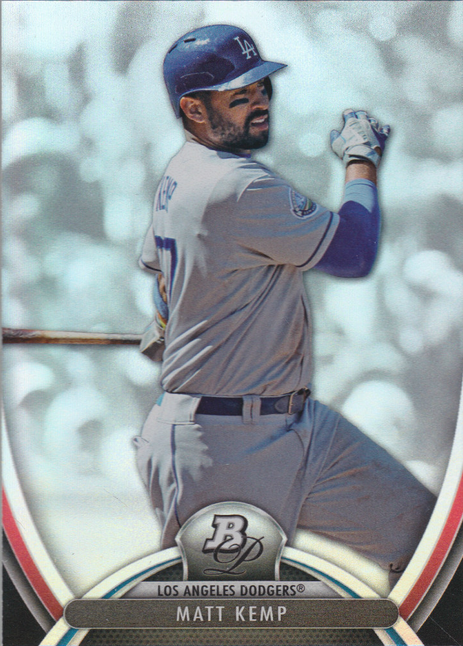 Gordon batted .175 with a home run and five RBI in 19 games during his previous call-up May 4-26. 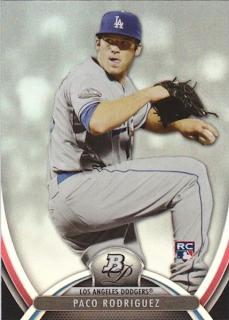 Fife, 26, was reinstated from the disabled list yesterday (right shoulder bursitis) and picked up the win with 5.1 scoreless innings against the Cubs. Fife has gone 4-3 with a 2.47 ERA in nine big league starts this season. Now I need to find that Dee Gordon t-shirt I wrote about previously. Pic above via Jon SooHoo/LA Dodgers. If Hanley Goes to DL, Who Comes Up? There's no denying that Hanley Ramirez has been one of the more important cogs to the Dodgers machine this season. He's been hitting like an MVP caliber player while playing the kind of defense I thought he wasn't capable of. Sure, he's not a Ozzie Smith out there, but he has been more than able to handle the position. In the meantime, we are left to wonder, "what happens now?" If Hanley Ramirez were to go on the DL, it is likely the Dodgers would bring up another short stop to cover the position. Earlier in the year, the Dodgers kept Justin Sellers on the roster, but he failed mightily with the bat and glove. Besides, nobody likes a hot dog on a motorcycle. 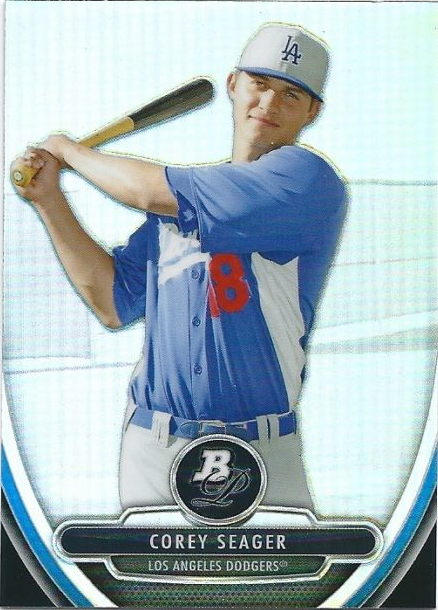 The top Dodgers prospect at the position, Corey Seager, just got promoted to High-A ball in Ranch Cucamonga. He figures on competing for a roster spot in 2015, so seeing him in Dodger Blue now would be premature. Seager needs more time to simmer. We could always recall Elian Herrera, but I find that to be a boring pick. Seen that, done that. The only good option in my mind is Dee Gordon. He's been sort of a lost soul in Dodgerland. At one time he was hailed as our short stop of the future, but withered away when he couldn't perform. 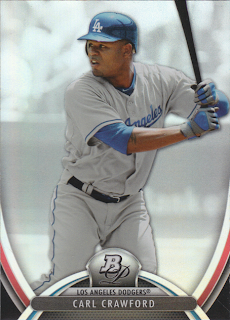 Soon thereafter, the Dodgers signed Hanley Ramirez and Dee's shine has been fading ever since. Since I feel obligated to throw some numbers your way I thought I'd mention that he is on fire in AAA right now. Over the past 10 games he has 15 hits in 39 at-bats for a average of .385. He has stolen 8 bases and is OPS'ing an otherworldly 1.005. See his stats at MILB here. If there is a good time to give him a shot at proving his value, it's now. Dee Gordon just might rekindle those positive feelings we all felt when we thought he could be a star. Furthermore, I've got a Dee Gordon T-shirt in my closet that needs to see some sunlight, and all I'm looking for is an excuse to put it back on. Pic Credit Above via Jon SooHoo/LA Dodgers 2013. 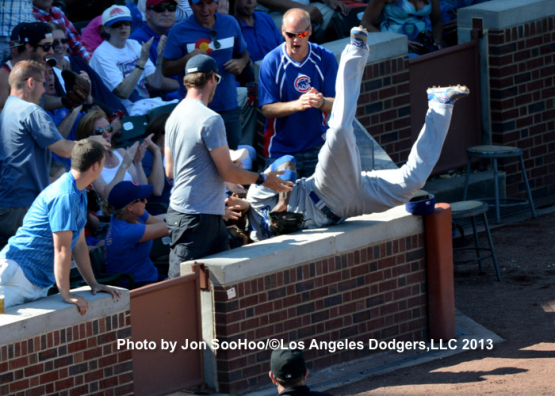 Hanley Ramirez took a tumble into the stands yesterday afternoon, and had to leave the game early. There is no word yet on his condition. Hopefully it isn't serious. According to Ken Gurnick at MLB.com, he will have an MRI today. 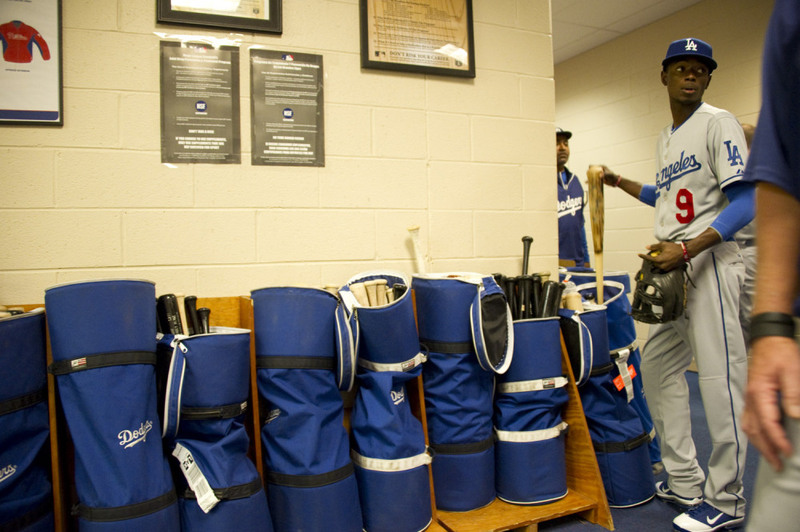 Pic via Jon SooHoo/LA Dodgers 2013. 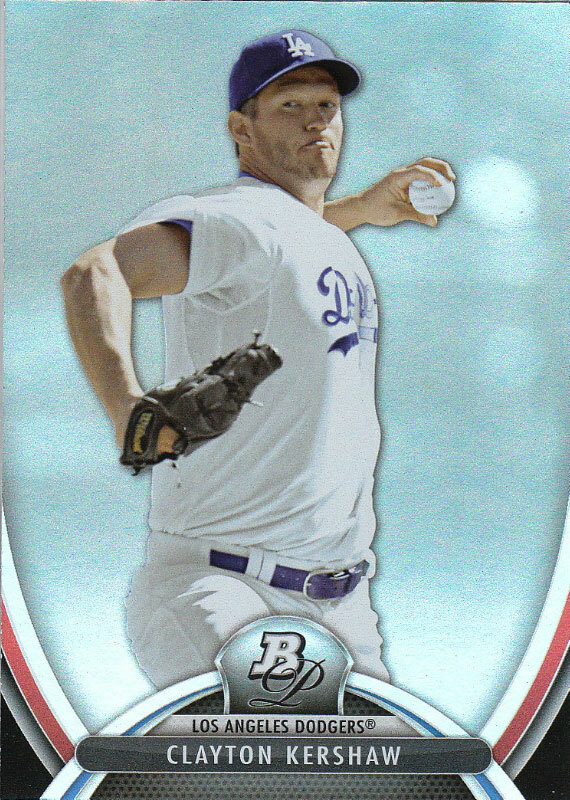 "Phenomenal bullpen key to Dodgers’ revival," via Jon Weisman at Dodger Thoughts. But when you look at how the Dodgers have been playing .811 ball since June 22, winning games like they were free throws, much of it comes down to this – the bullpen simply just keeps getting guys out. Gabe Kapler at the Daily Gammons writes, "The Face of MLB: Yasiel Puig". In my own career, I literally fought back smiles after a big double and stuffed anger down after a strikeout with the bases loaded. The voice of my college coach rang in my ears, “Act like you’ve been there before.” he told us. This behavior stripped me of personality on the baseball field but enabled me to appear professional, in chorus with Charlie’s sentiment. If I could do it all over again, I’d maintain my humility but release a bit more joy. I always experienced envy when watching other players authentically express pleasure during competition. Peter Gammons at the Daily Gammons writes, "Revisiting the Red Sox - Dodgers deal". Dodger Penguin recaps the Jack Morris autograph session at Harry's Dugout. The Dodgers release Ted Lilly, via Ken Gurnick at MLB.com. The Panini VIP event that featured Puig was a big hit. Tracy Hackler at Panini's blog shares some pics here. 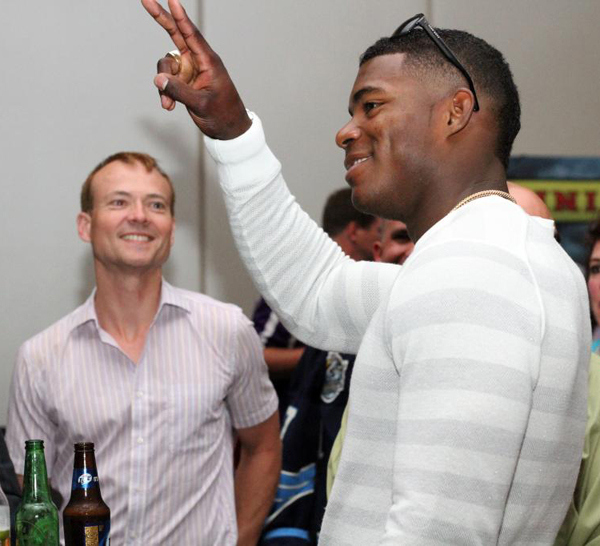 Yasiel Puig shares the below photo from his appearance at the Panini's VIP party at the National. He stands with Pedro Martinez and Johnny Damon. I love this kind of stuff. Ryan G at Chaos and Kanji writes, "Taipei's Coolest Museum: The Miniatures Museum of Taiwan". On the first day of the National Sports Collectors Convention Topps officially released their newest Bowman Baseball card set. It is called 2013 Bowman Platinum. There are numerous autographs and relics available, and the biggest draw this season is Yasiel Puig. He has several autographed cards in the set. Unfortunately, none of them are seeded into packs. Instead, you'll get a redemption card. 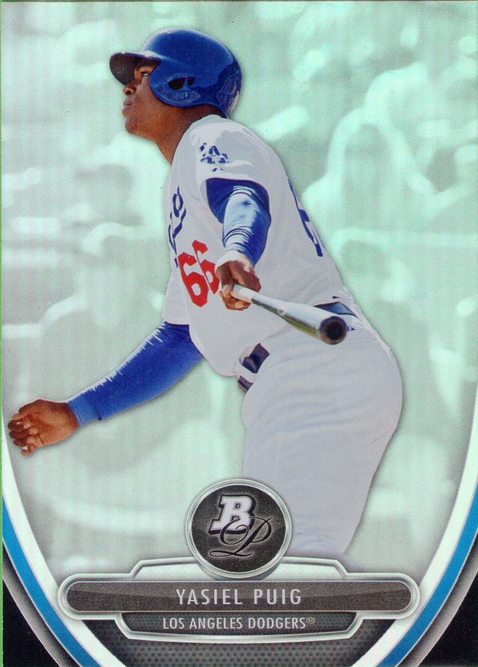 BTW, the Yasiel Puig Superfractor base card has already been pulled and was recently graded by BGS as a 10. See my story about the card here. It is currently for sale on eBay. 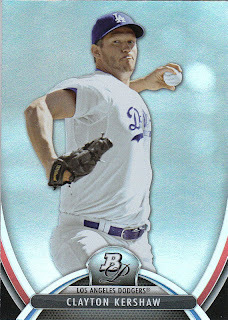 I'll have pics of the Dodger inserts and relics available in boxes tomorrow. 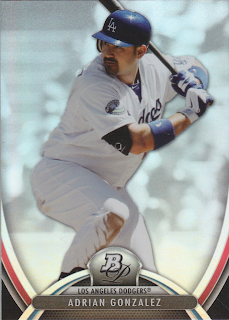 Today, I show you all of the Dodger base cards within the set. See them below.